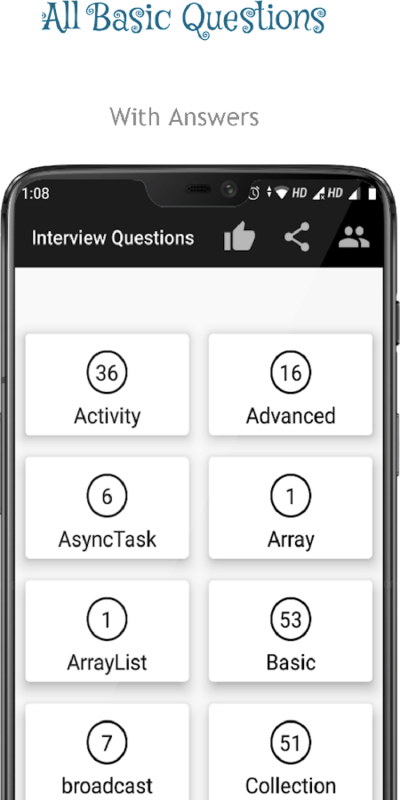 Excellent app to learn core and advance Java with interviewandpractical questions also. Striking Features: 1. IntroductiontoJava 2. OOP’s 3. Package and Interface 4. Exception Handling5.Java IO and Networking 6. Java Threading 7. Java Applets 8.JavaAWT 9. Java Swing 10. Java JDBC 11. Java Servlets 12. Java JSP13.Java Interview Questions Bank 14. Java Solved PracticalQuestionsKeywords: java, core java, advance java, oop's with java,awt,applets, swing, jdbc, servlets, jsp, rmi, java interviewquestion,java practical questions. It is very helpful for both fresher and experienced Javadevelopers. All answers of Java interview questions are short andclear. Only Important Java Interview Questions are covered:- 1.Java Basics Interview Questions and Answers 2. Core Java InterviewQuestions and Answers 2. JDBC 2. JSP 2. Hibernate 2. Spring 2.Servlet 2. OOPs((Object Oriented Programming concepts) InterviewQuestions and Answers 3. Inheritance 4. Polymorphism 5. Abstractclass 6. Interface 7. String 8. Collection 9. Multithreading10.Exception All are important Java Interview Questions andAnswers. Please suggest us with your valuable feedback.